Pioneers in the industry, we offer raised floor from India. We are among the leading names in the market that are engaged trading and supplying False Flooring (Raised flooring). 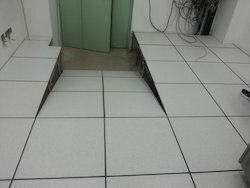 Berry Floor is having rich experience in the execution of False flooring for server rooms and for other industrial applications. We do both supply and fixing. We have executed several projects in and around Tamilnadu, Andra Pradesh and Kerala.